We love to get a panoramic view over a city when we travel to new places. In Europe, that view is usually achieved from the top of a church steeple, surmountable only by the arduous climb up many narrow winding steps. The kids accomplish this effortlessly, while hubby and I huff and puff our way up on aching knees. A couple weeks ago I posted about two great vistas, one from the Basílica de la Sagrada Família in Barcelona and another from the Nieuwe Kerk (New Church) in Delft, the Netherlands. Two other climbs worth undertaking are Europe’s tallest medieval church spire, the Cathédrale Notre-Dame-de-Strasbourg, and the Stephansdom in Vienna. 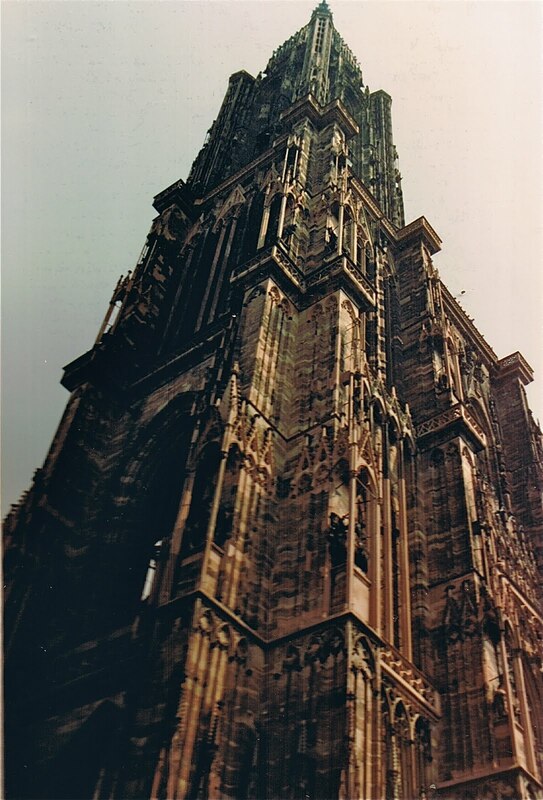 The Strasbourg Cathedral’s single bell tower and its spire reach 466 feet in height, and for over two centuries was the tallest structure in Europe. 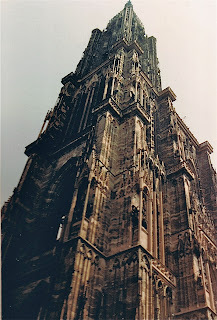 The cathedrals of Cologne and Ulm in Germany, and that of Rouen in France, are higher, but since they were not constructed until the 19th century, Strasbourg remains the tallest tower built in medieval times (it was completed in 1439). The glorious Gothic cathedral is Strasbourg’s most famous landmark and you can’t miss it. A second tower was originally planned to be built, but it was never carried out, perhaps because Gothic architecture had gone out of fashion or because the townspeople were too poor to finish the task. Its characteristic asymmetrical form, however, continues to symbolize the region of Alsace . To experience a breathtaking view of Strasbourg, and, on a clear day, see almost 20 miles all the way to the Black Forest in Germany, climb the 332 steps to the viewing platform on top. I recommend doing this early in the morning when it is still cool and before it is too crowded, as the narrow staircase is steep and winding. Admission to the magnificent cathedral spire is €3.00 for adults, €2.30 for children 5 – 18 years. Admission is free with the Strasbourg Pass which gets you in to other attractions as well at no cost or half price. In the summer the tower is open from 8:30 a.m. to 7:00 p.m., and the hours vary in the off season. 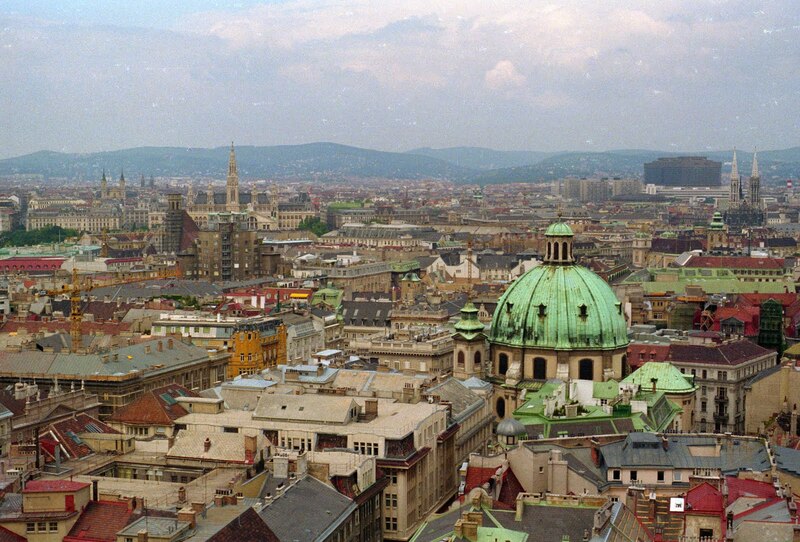 St. Stephen's dominates the skyline in Vienna. Interestingly, St. Stephen's Cathedral (Stephansdom in German) is another one-towered Gothic church, symbolizing another great European city: Vienna, Austria. The South tower of St. Stephen's is 450 feet tall, and if you climb the 343 spiral steps you will be rewarded with sweeping views of this world-class city. At the top of the tower you will notice an apartment which housed the watchmen who, until 1955, manned the tower at night and rang the bells if there was a fire in the city. The South tower is currently being renovated and visits may be restricted. If the South tower is closed or you just want to cheat, there is an express elevator that will take you to the observation deck of the unfinished North tower, which is only 224 feet high, but still delivers an awesome view of the Danube and Vienna. The cost is €4.50 and tickets can be purchased in the church's gift shop. 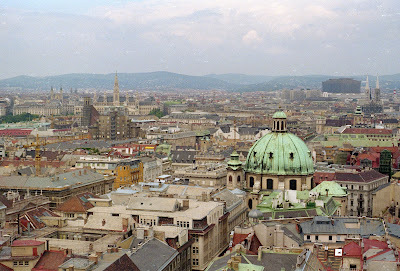 Regardless of whether you ascend St. Stephen's for the view or not, you will want to admire this very famous Gothic cathedral in the heart of Vienna. Its most recognizable characteristic is its diamond-patterned, richly colored roof consisting of 230,000 glazed tiles. There are also mosaics inlaid on both the north and the south side of the roof. It is a fabulous structure worth seeing. 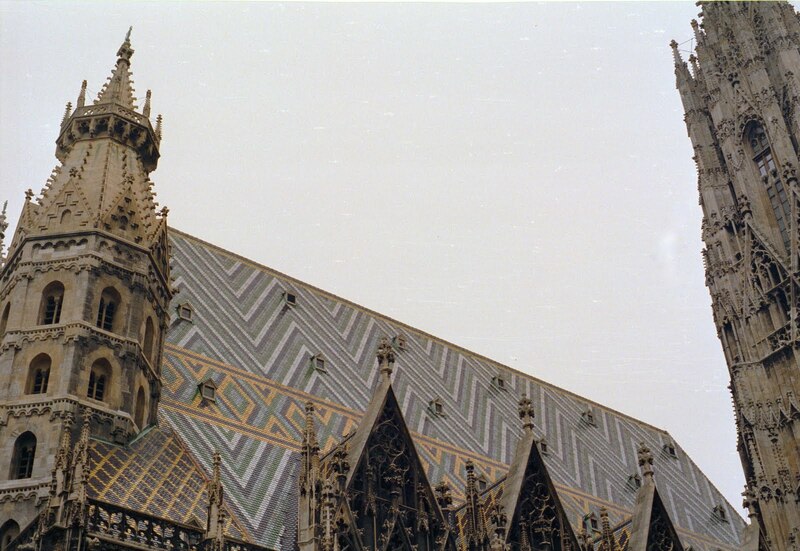 Tile roof of St. Stephen's in Vienna. I've been in jury duty for the last week and have been climbing to the 11th floor via the stairs twice a day...it has been a constant reminder of all the climbing I did in those beautiful churches across Europe. 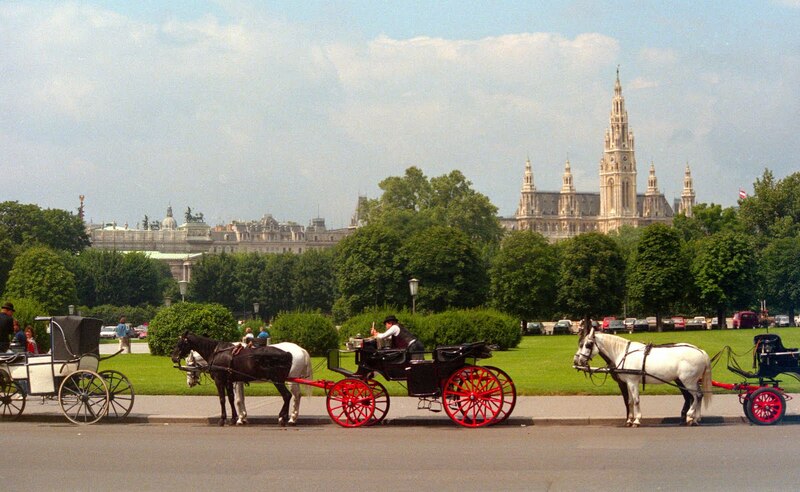 Each day, before I open the door at the 11th floor, I say, "Please God, let me be in Vienna or Florence now!" Those views are ALWAYS worth the climb! Following back from the hop. I put a link up if you want to join in on my Blog Comment Tour. Next month anyone that signs up will be doing a hop of the linked blogs. I am writing a blog post about Strasbourg and I found this very nice picture on your site, with Notre-Dame Cathedral. Can I use it, citing your site as the author? My blog is http://da-scoprire.678voli.it/ (in Italian language) and I am writing about various cities, mostly in Europe. Sure, Debora, that's okay. Please send me a link to your post after you've posted.